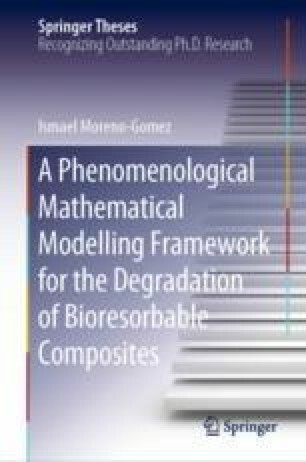 As previously mentioned in the introductory chapter, studying the degradation of biocomposites is a time and resource-consuming process. Therefore it is logical to try and maximise the information that can be extracted from already published experimental data. Although inaccurate and incomplete information in composite characterisation are to be expected, analysing these published degradation data with the computational models obtained from the general modelling framework based on an extended version of Pan et al.’s TCP-polyester composite degradation model  and presented in Chap. 3 is, in the author’s opinion, still a worthy approach. By doing so, a global degradation map for biocomposites can be built. This map, albeit incomplete, will aid understanding of the biocomposite degradation mechanisms and highlight areas of particular interest due to their appropriate degradation profiles. PubChem (2005c). CID: 24456. Retrieved September 1, 2016 from https://pubchem.ncbi.nlm.nih.gov/compound/Calcium_phosphate#section=Top.